Ah, Mother’s day. The one day a year us moms get to “take-off.” The day to be served inedible breakfasts in bed, wear lovingly crafted pasta necklaces made just for Mom and admire precious scribbles masterfully stroked by tiny hands. I wouldn’t trade it for the world. So for all you mothers out there and everyone who has a mother, this is for you! Afree printable hi-res file containinga bit of mother’s day goodness. Print it, cut it out and decorate up your mother’s day bouquets, centerpieces, or make it swing from the chandelier! I know ya’ll are crafty out there and will come up with a million creative ways to use this medallion–send pictures, I’d love to see them! 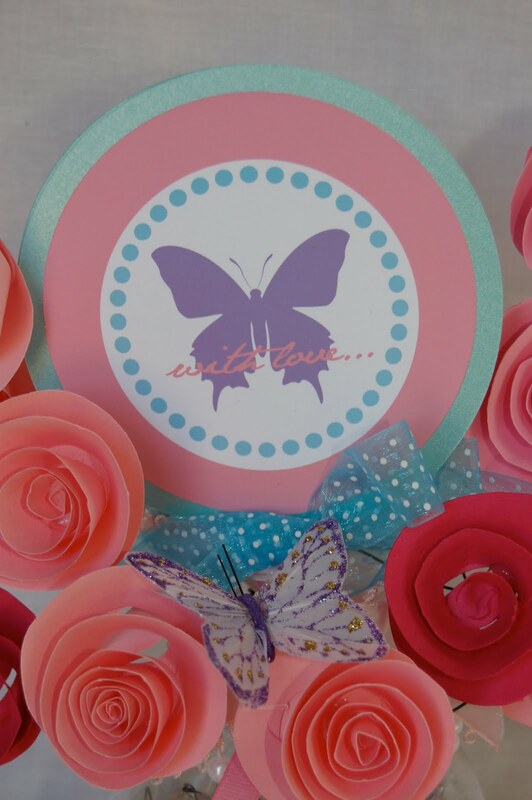 The circle on the front of this fun little project says “Happy Mother’s Day” and the back “with love” — both accompanied by butterflies from my butterfly kisses line. And in case you missed it the first time, down load the file here. 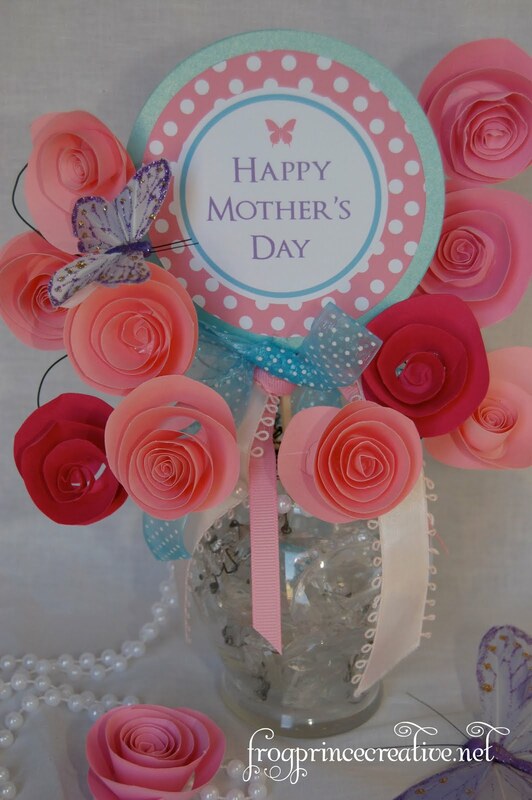 As for the pretty little paper roses surrounding the printable, you can get a full tutorial on how to make them at Dozi. After all the cutting and rolling, I put glue dots on the backs and affixed them to floral wire. From there, I just gathered my little bouquet and wrapped the free ends of the wire around a dowel and arranged the flowers in an aesthetically pleasing manner. And so they’d look nice. And it goes without saying, this file is for personal use only, not to be sold or copied, etc. etc. If you’re using it in a way that wouldn’t make your momma proud, don’t do it. Thank you for this beautiful idea! You're very welcome! Hope you enjoy. love it, thank you for sharing!!! I hope you don't mind that I shared this on my blog today. I linked back!